Lions and leopard and rhinos, oh my! 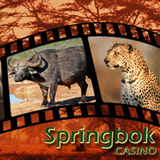 Springbok Casino’s is very proud to be South Africa's favorite online casino and this month they salute the majestic wildlife that makes South Africa such a special place. Their Big 5 Sundays event pays tribute to Elephants, Leopards, Lions, Rhinoceroses and Water Buffalo with deposit bonuses, no-deposit bonuses and freeroll slots tournaments each Sunday in November. There will be a R2500 freeroll slots tournament and an up to R3000 deposit bonus. There will even be a $1500 no-deposit bonus every Sunday! The Big 5 Sundays event begins on Sunday, November 2 with the R2500 Elephant Free Roll Slots Tournament. You can also claim an up to R3000 deposit bonus by entering coupon code ELEPHANT150 when you deposit. You can then claim a R1500 no-deposit bonus with coupon code ELEPHANTFREE. The following Sunday the casino salutes the Leopard. On Sunday November 16th the Lion is the Big 5 star with Rhinos in the spotlight November 23 and Water Buffalo November 30. The coupon codes for these weeks are in the video above. If you prefer to play casino ames on your smartphone or tablet, Springbok has a great selection of games in its mobile casino as well.